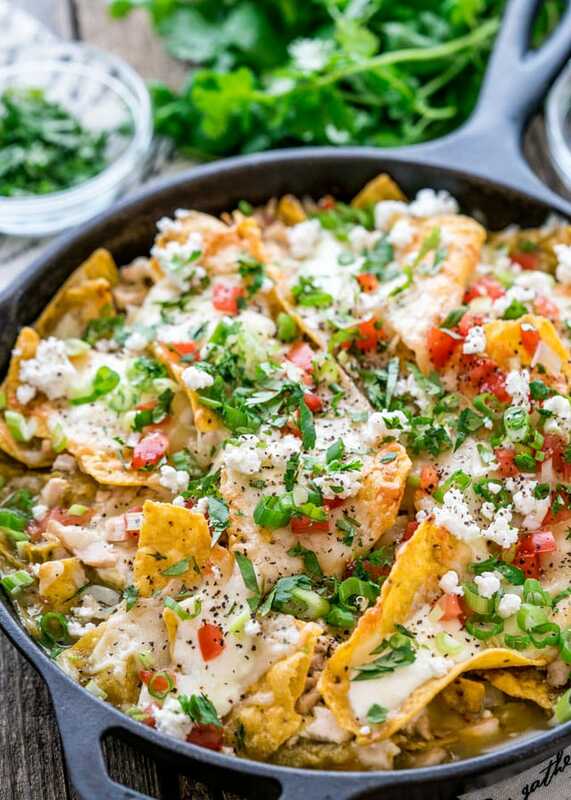 These Tex Mex Chilaquiles can be on your table in only 20 minutes and are perfect for breakfast or brunch! 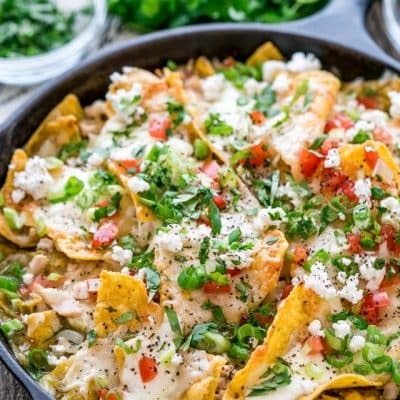 These chilaquiles are loaded with turkey and smothered with cheese and green enchilada sauce. I’m back after having a couple days off and so happy that I’ve been so productive. I actually finished my Christmas shopping, well maybe 90% finished, but close enough. I took advantage of the black Friday specials and couldn’t be happier. Usually, I wait till December 20th to start my Christmas shopping, so this is new for me. So many times I wished that I was like those people that shop for Christmas gifts year round. The problem with me is that I can’t keep the gifts that long, when I buy something for someone, I get so excited and I want to give it to them right away. What made me even happier is that the weather is still nice here, nice enough that you could walk around in an outlet mall and not freeze to death. 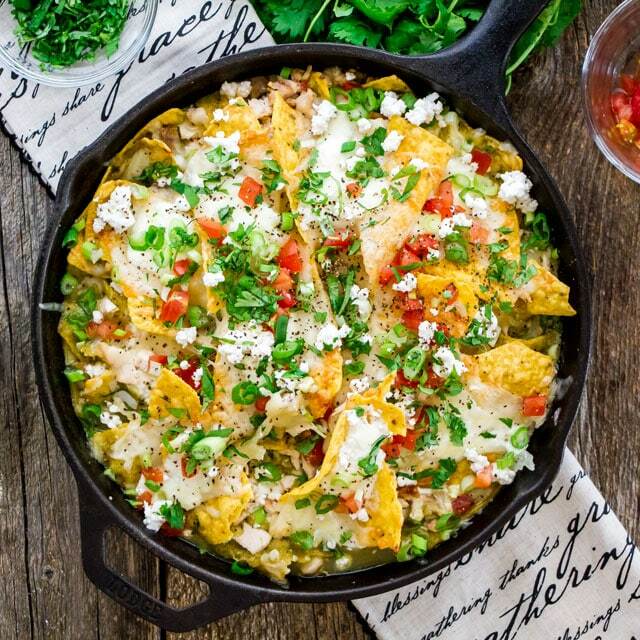 Tex Mex Chilaquiles! Have you guys ever had them before? Chilaquiles are usually corn tortillas cut in quarters and fried, then green or red salsa is poured over them, and cooked until softened. Sometimes pulled chicken is added and they’re usually garnished with crema, shredded queso fresco and avocado slices. They are also usually served with refried beans or eggs, which is why they are commonly eaten at breakfast or brunch. I’m cheating a bit here with my chilaquiles and I’m using tortilla chips. Now I bet most of you still have lots of leftover turkey after Thanksgiving, so this is a perfect use of that turkey. But you could use leftover chicken, or leftover beef, whatever you have. All that you really have to do with this dish is layer everything in a large skillet. Start with some green enchilada sauce, or salsa verde, they’re essentially the same thing, then top with turkey, chips, sour cream, cheese and repeat. All that’s left to do is bake this for 10 minutes until everything gets heated through then serve it while it’s hot. As I said this is usually served with refried beans and eggs, so feel free to fry up some eggs and serve it for breakfast, but personally I like to just get in there with a fork and have at it. 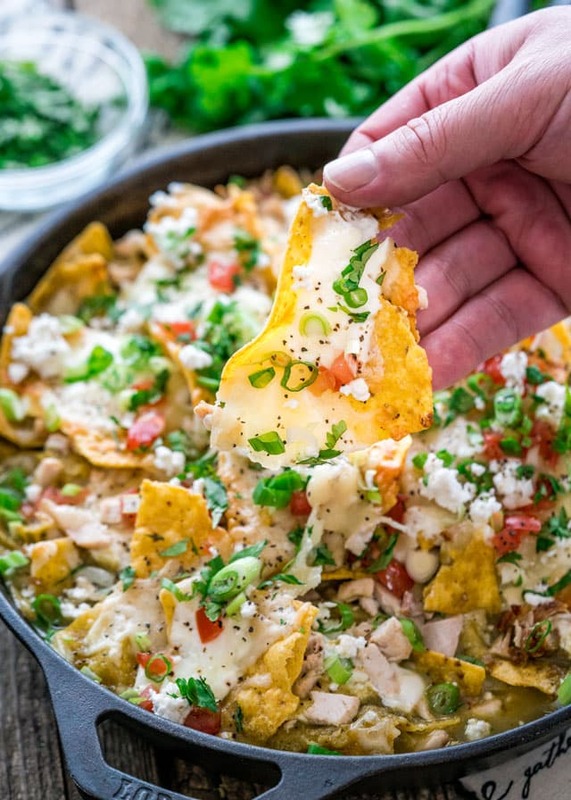 The top tortilla chips are nice and crispy while the inside tortilla chips have softened so you have a nice gooey mess of tortilla chips, turkey or chicken, enchilada sauce, gooey cheese and sour cream. It’s a party in your mouth, that’s for sure. 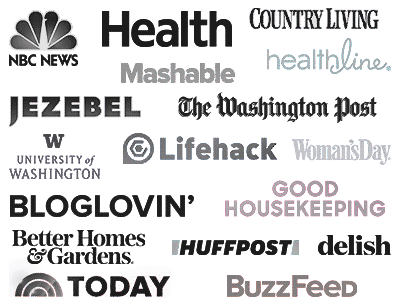 Try some of my other Tex Mex recipes! Spray a large skillet with cooking spray. 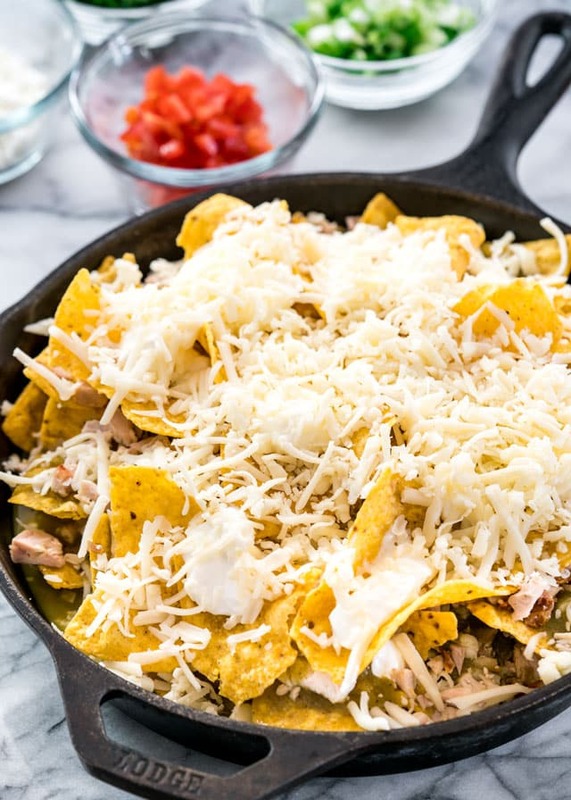 Spread 1 cup of the green enchilada sauce on the bottom of the skillet then start layering with 1/3 of the turkey, 1/3 of the tortilla chips, top with 1/3 of the sour cream and 1/3 of the cheese. Repeat with remaining enchilada sauce, turkey, chips, sour cream and cheese 2 more times, to make a total of 3 layers of each ingredient. Bake for 10 minutes or until hot inside and all the cheese has melted. Top with chopped tomatoes, green onions, feta cheese, cilantro and black pepper. If you want to use an egg for this recipe, you can either top the chilaquiles with a fried egg once they're done cooking or you can crack an egg right on top before putting the pan into the oven. 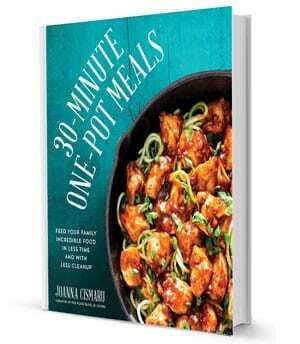 You can use any type of meat for this recipe. You can use queso fresco instead of feta if you prefer. We are originally from Texas and love this recipe. Use A can of rotel and green chilies to spice up a bit more but every recipe I use of yours is great! I’ve never heard of chilaquiles but thank you so much for the introduction! They look amazing! Let me know how you like them if you try them! So glad you liked it, Mehndi!